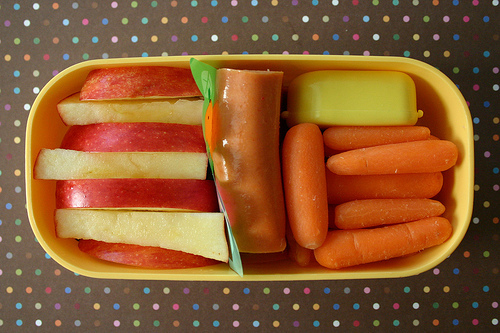 This healthy lunch is full of choking hazards for your pre-schooler. Just yesterday, a friend was telling me that during her son’s recent hospitalization she saw a truly terrifying sight. A severely retarded 3-year-old who cried all day, with nobody to comfort him. It turned out that a year before this boy had choked while eating in his high chair. His mother immediately tried to dislodge the piece of food, but was unsuccessful, and severe brain damage resulted. The mother and father have 6 other children at home, so this poor boy spent his days alone at the hospital. Crying. So when I saw that the 2nd most Emailed article today in the New York Times was an article about choking hazards for children, I read it carefully, and I was very surprised by the information I found there. Did you know that in the US in 2001, over 10,000 children were treated in emergency rooms for food-related choking. In 2000, 160 children died from an obstruction of the respiratory tract. Lollipops- Flat lollipops are safer than ball-shaped. If a child is choking, don’t wait. Call 911 (101 in Israel)- IMMEDIATELY! This information is definitely going to change what and how I feed my younger children. I’m also going to show this list to my husband today. With G-d’s help and the right information, may we keep our kids safe and healthy!